EF is a massive educational tour company offering global group travel to students of all ages, and companions -- parents, siblings, wives, whoever. EF Tours are accompanied by at least one adult and run year 'round. EF trips are instigated by teachers or interested adults, who become "group leaders" and sign up participants. Ask at your counseling office, call EF to learn whether a teacher in your area is planning a trip, or ask your favorite educator to consider planning some travel. You can join an existing trip or combine schools to put together a full group (shoot for 20). If your group isn't large enough, you'll pay more or be asked to join another group (do that). Trip costs vary by destination, but EF does guarantee the lowest prices in the student group travel industry. 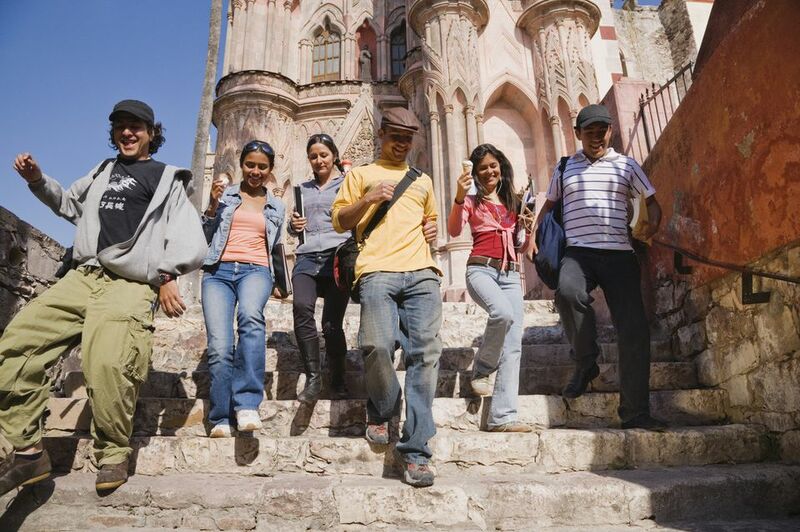 Understand that most educational group travel is budget -- meaning non-central, inexpensive hotels and cheap eats. Flights may have layovers -- cheaper flights do. Know that things beyond EF's control, like airport fees, may affect final pricing. EF writes, "Because of our size, we are able to negotiate excellent rates without sacrificing quality." The big question: How to come up with the bucks? A teacher in Virginia Beach runs student group travel through her school's student loan program -- an idea worth asking your admin about. EF Tours offers an auto payment plan -- exceedingly affordable at $50/month and up, billed monthly to your credit card. You're the ultimate judge on spending money brought along; remember that lunch is not included in an EF tour's cost. Consider asking your parents to pay -- travel is as broadening as college. Once you've made the decision to go, enrolling is a snap -- the teacher or adult organizing the trip will probably disseminate sign-up info or you can sign up online with an enrollment fee (typical of group student travel companies). Once you enroll in any kind of group travel and pay your money, you've made a contractual commitment with the company organizing the travel. Understand what you're signing and saying. EF Tours has two tech trip helpers, both aimed at integrating international experience, via student travel, and technology. If you're one of the many student travelers who'd rather carry earbuds than guidebooks, you'll find EF on iTunes or TourCast, great trip guides via iPod. And EF is also introducing iStory Tours: Traveling with your own Apple tech. After enrolling, you can download walking tours and more, narrated by EF tour directors, to whet your travel taste buds. Your group leader can create an EF webpage -- ask if you don't hear about one. Use it to find packing lists, enroll if you haven't, and download pre-departure info like schedules and hotel addresses. Big tip: Hopping continents while hauling lots of luggage is a drag. Your group will be assigned an EF tour consultant after enrollment -- use that resource. He/she will send tickets, schedules, and last-minute info to the group leader, as well as helping you understand accreditation possibilities. EF offers school accreditation for travel; sign up well before you travel. Get a one-hour semester credit through Eastern Washington University and EF. Check high school accreditation possibilities with your school - tell them EF has its own education panel and employs someone full-time in its US office to handle school credit for travel. Your teacher may choose to provide class credit independently: Propose it. Your EF tour consultant (above) can help.